Betty Claybrook and her granddaughter, Cynthia, look through a memorial album which shares photographs of the life of Bettyâs son Josh. Josh Claybrook, a Summit High School graduate, took his life in June 2006 at the age of 27. Editor’s note: This is the first installment of a series on mental illness in Summit County. The photo album records the arc of the life of Betty’s oldest child, Josh. It opens with a birth certificate from St. Joseph’s Hospital on which his tiny, delicate footprints are stamped. He was born at 8:40 in the morning on May 21,1979. He weighed 6 pounds and 4 ounces, and had a healthy swatch of dark hair. Subsequent pages in the album reveal familiar moments in the lives of mountain kids living in a then-blue collar Summit County: Josh in snow pants as a toddler, with his baby sister Jamie by his side. Josh skiing off small cliffs, riding snowmobiles and riding mountain bikes on family camping trips to Moab. Josh in a cowboy hat; Josh in his beloved 4WD truck. Later, there are pictures of Josh with his own sons Elijah and Peyton, and Josh hoisting his niece Cynthia into the air when she was a toddler. In the photos, everyone is youthful and often smiling: still with hope for better futures ahead. Toward the end of the album are a handful of photos from Blackfoot, Idaho. That’s where Josh Claybrook took his life at age 27 on a summer day in June 2006. In many ways, Josh’s life and death are still a mystery that Betty is unravelling, one that involves a deep weave of loss, illness, addiction, denial and stigma. Inside that weave is also public awareness and timing: Betty became a parent at a time when addiction and mental illness were rarely discussed, recognition of such illness was slim and crucial information about mental health wasn’t widely shared. In schools, families and communities, emotional outbursts were more often understood as behavioral issues, not as red flags that might signify serious underlying health issues. Jamie was born two years after Josh. Shortly after, Betty and her husband divorced. The kids migrated between their home in Summit with Betty and their father’s home in Idaho Springs. Like many teens, both experimented with alcohol. To Betty, Josh seemed to be doing fine and adjusted well to the family changes; Jamie struggled more. She was 6-feet tall in high school and stood out. She had learning disabilities. She hated the way the medications she took for ADHD made her feel; she felt ostracized in high school. Unsure how to ask for help, she acted out with impulsiveness and anger. Recent neuroscience research has expanded understanding of how opiate receptors work in the brain. The National Institute of Health now recognizes addiction to opiates and other drugs as a “chronic, relapsing brain disease with a wide range of serious medical consequences.” This recognition of the basis of addiction in powerful, often uncontrollable neurochemistry is beginning to shift the narrative of addiction, increasing our understanding of how easy it is for people to fall into and how painfully hard it is to escape. For Betty, insight into her daughter’s struggles and the life of her son came after she sought more understanding of her son’s suicide. Attempting to learn more about a Suicide Prevention walk taking place in Summit County, she discovered the National Alliance for Mental Illness. The organization offers peer-led support groups for individuals living with mental illness and education to their families, partners and friends. In NAMI, Betty found a place where she could talk about her children and gain insight into their struggles without feeling judged. Her experiences there have not only given her insight into the deep impact mental health struggles may have had on her son, but have also helped her support the daughter who still struggles. 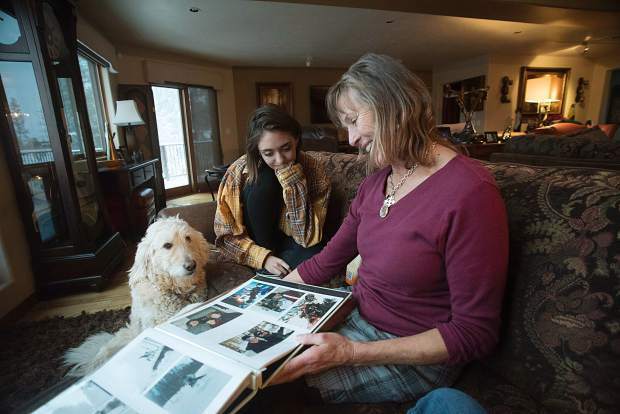 A decade after the loss of her son, Betty finally feels an opening to share her own story thanks in large part to the honesty with which other Summit County families have begun sharing their own losses. At a January 2016 memorial service for longtime Summit County local and philanthropist Patti Casey, Patti’s family spoke openly about her suicide and the long, painful struggles with depression and addiction that preceded it. Patti’s daughter, Betsy, has also written publicly and eloquently about the loss of her mother and her own struggles in the aftermath of her death. Betty feels that their honesty has been a powerful wake-up call to the community, creating awareness that mental illness and addiction can happen in any family, and across all socio-economic boundaries. The unconditional love of her dog Zachary offers Betty moments of joy as she moves through her long grieving process. It seems fitting that he came into her life through the granddaughter she’s deeply committed to parenting to fill the void that illness has created in her daughter’s own parenting capacity. Betty’s long journey to understanding her children’s complicated pain and struggles is creating a space for resolution. Kate Lapides is a freelance writer and photographer who lives in Breckenridge.